The summer heat calls for frozen treats. The difficulty is finding an affordable variety of frozen treats that aren�t packed with extra sugar and other unnecessary additives. Here are some naturally yummy frozen treats that will melt a little nutrition in your mouth and help keep you cool this summer. The kids will love making and eating these chilly treats. Tint � cup of yogurt with red food coloring, 1 � cups with blue food coloring and leave the rest white. Use wax paper to make cone liners by folding six 12-inch square sheets into triangles, wrapping each around a sugar cone, and using tape to hold the shape. Then place the paper cones inside the sugar cones. Cut six circles out of the top of the cone box and use as a stand to keep cones upright. Fill each cone with 1 tablespoon red yogurt, 2 tablespoons white yogurt, and 3 tablespoons blue yogurt. Insert a popsicle stick and freeze for 4 hours or until firm. Slide frozen yogurt pops from sugar cones and serve. You can also make these into fruit & yogurt pops by adding raspberries to the red yogurt mixture and blueberries to the blue yogurt mixture, very tasty. Peel bananas and cut in half crosswise. Insert a wooden popsicle stick into flat end of each banana half. Lay bananas on a shallow pan or baking sheet covered in wax paper; freeze approximately 3 hours, until very firm. In a small microwave safe bowl, melt chocolate chips. 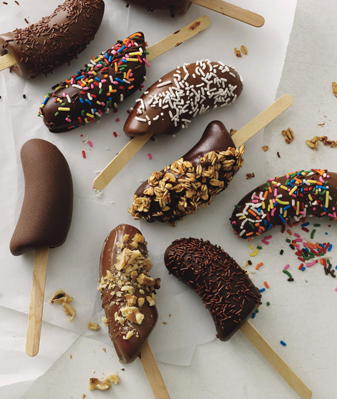 Use a spatula to quickly spread melted chocolate over each banana, coating well. Chocolate will become firm right away. Wrap each banana in foil or plastic wrap and store in freezer until ready to eat. Bananas are also delicious with sprinkles or flaked coconut but you have to be quick, the chocolate hardens fast. Combine all ingredients in a pitcher or large bowl, pour into paper cups and freeze overnight. You can place a stick in these after an hour or two of freezing to make chunky popsicles or simply eat with a spoon right out of the cup. Stay cool and healthy this summer!